As part of a tour of the north, I decided to visit some new cities within the UK on recommendation from other food lovers and Leeds was first on the list to hop on the train to. I haven’t been to Leeds previously, but had heard a lot of great things about this exciting city, with it’s independent shopping and varied food experiences and the friendliest people I’ve ever encountered, it truly didn’t disappoint from the very moment I stepped off the train platform. 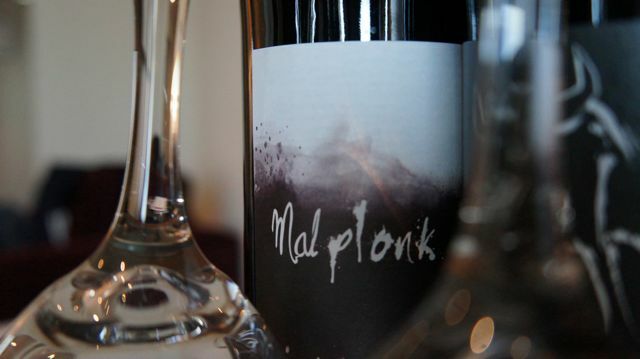 Malmaison Leeds is part of the Malmaison group, said to be named after the Château de Malmaison on the outskirts of Paris and is the very same group behind the boutique “Hotel Du Vin” hotel chain within the UK. 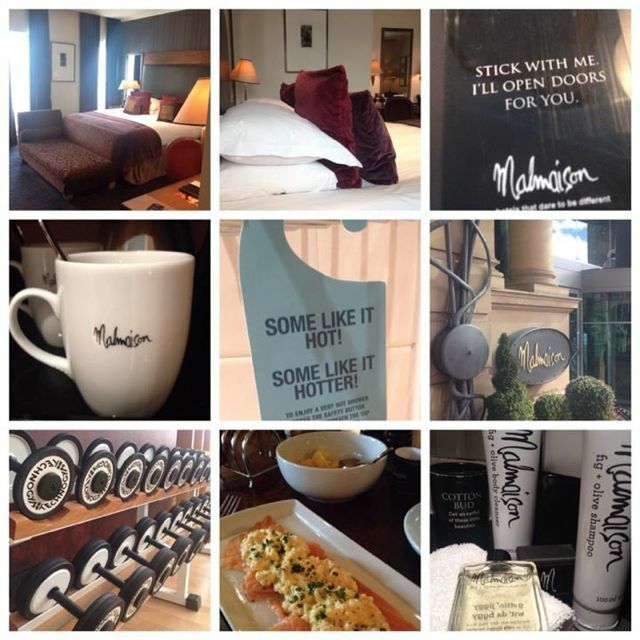 There are currently 13 Malmaison hotels within the UK in locations such as Aberdeen, Birmingham, Edinburgh, Glasgow, Liverpool, London, Oxford and Reading, all very different and unusual in their own ways, usually hosted within quirky buildings with interesting histories. Malmaison Leeds is located centrally, just a few minutes’ walk from the train station within converted offices, which used to be the Leeds City Tramways Office. This office was once used as the regional transport headquarters until privatisation of the public transport system and it’s now a very modern and high rising hotel overlooking the waterways of the City. 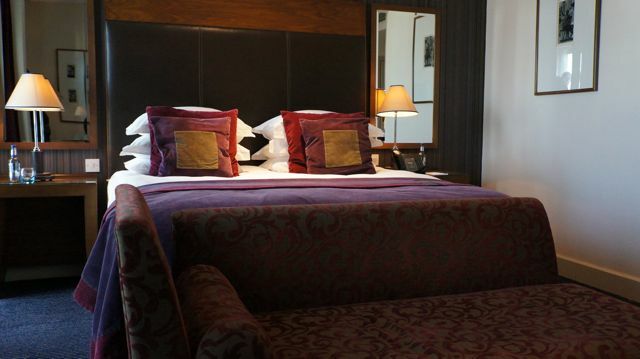 With over 100 bedrooms and suites at The Mal, there are many different options to choose from within this Leeds hotel. 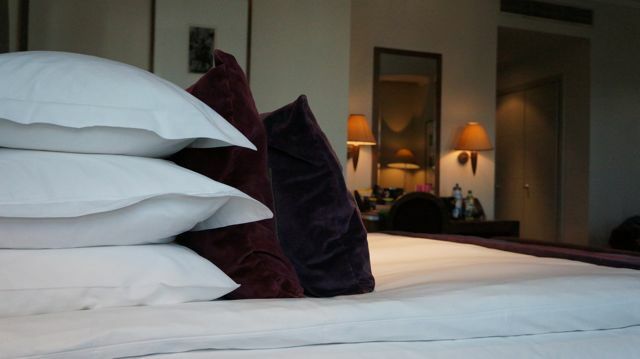 Cosy double, standard double or twin, superior double or twin, deluxe double or superior suite, the options are endless and offer a luxurious and modern getaway for business or personal stays, no matter what your reason for visiting Leeds. On arrival, I was an hour early, however this wasn’t a problem and the welcoming hotel team allowed me to check in a little earlier which was fantastic after traveling up by train in the wind and rain – I wasn’t looking glam to say the very least, frizz-tastic. There were no frills on checking in, no help with my bags, simply pointed to the lift and advised as to where to go for my room on the fourth floor. The girls at the front desk were friendly and chatty, making me feel welcome from the very beginning, however no name badges meant I had no idea who I spoke with, which doesn’t help to build a rapport with the team, so this was a bit of a shame. I was advised on where to go for breakfast and at what times each day, I was offered a wake up call and newspaper delivery each morning and I was told how I could gain a discounted parking voucher when my traveling companion joined me for the second night, all very helpful without even having to ask. We were in room 407, a deluxe double for the duration of our stay. It was a large bedroom, with floor to ceiling windows to allow for perfect natural light, a waterside view and very clean and modern facilities within the room, including a Smart TV and individual air conditioning panel to control your own room temperature. The bathroom was a nice size, with a full size bath and built in non-slip safety mat and it was begging for me to use it for a bubble bath (I’m not usually a bath gal), of which I did on the first night. I adored the monochrome colouring throughout the room, even the tiling in the bathroom matched this theme, as did the black and white toiletries and coffee mugs within the bedroom, it was all very uniform, which I really liked. There were a total of 5 mirrors throughout the room, perfect for head-to-toe vanity and the bathroom tissues were folded into intricate toilet roll origami shapes of which pleased my inner geek hugely. The large wardrobe housed fluffy bathrobes, spare towels or varying sizes, a powerful hair dryer, ironing board and iron (a nice touch) and a mini bar filled with tempting beverages and naughty snacks galore (including “ProperCorn” popcorn and sweet treats from “The Grown Up Chocolate Company”). I also found the tea making facilities tucked away within the wardrobe which included wine glasses (and the wine should you fancy it!) and posh lemon curd or blackcurrant shortbread biscuits to dunk into a cuppa on arrival. The room housed a large king sized bed with plenty of pillows to sink into, but they were literally so fluffy that they simply sunk to the bed, I can only explain as laying on a whoppee cushion as soon as you set your head on them, it was a real let down – literally. On the second night, I had to ask for two more pillows to be brought up and even laying on three of these goose feather pillows, they still sunk and allowed for a pretty poor sleep. The bed itself was very firm, which I prefer and if it hadn’t been for the pillows, it would have been a near perfect bed. Thick, heavy velvet curtains were brilliantly thought out, blocking out the city lights at night and allowing a snoozy lie in the next morning – if you like a darkened room, you’ll love these curtains! There was plenty of seating, including arm chairs for reading the paper in, a chaise longue for reclining in front of the television and a comfortable chair and writing desk, we certainly weren’t restricted to perching on the bed within this room. There was plenty of space to literally run around and carry out a circuit or two as a morning workout, of which I did with my iPad linked up to the wifi to sweat out to my favourite tunes online – I was a happy bunny! The power shower has different settings, but we learnt that it isn’t made for anyone over 6ft and the bath runs fast, so don’t leave the room to take a call, as the bathroom info advises – they certainly aren’t fibbing. Towels are cosy and large enough to wrap around me… So will wrap around anyone perfectly and the heated towel rail means no cold, damp towels the next time you need them, it’s a well thought out bathroom. This hotel is home to a sophisticated cocktail bar and darkened, almost cavernous brasserie, perfect for intimate gatherings or a bite to eat alone. We didn’t eat a main meal here, as there were too many other places to discover whilst visiting on this occasion, however, I saw their trademark MalBurger on several occasions whilst sat there enjoying a drink or two and they looked superb – noted for next time. They use local ingredients where possible and like to put modern twists on British classics, including their Sunday lunches with locally-produced beef and homemade Yorkshire pudding…. Who could resist?! Their chefs also like to add French twists to their foods and match fine wines to each course, the finer details are thought of for a romantic meal for two, through to conference and event catering for larger groups, of which we saw taking place in their private dining lounges whilst visiting. Now, this is something we did partake in, with mixed reviews thoroughout our stay. On the first morning, staying on my own, I had a delightful offering, opting for the deliciously fresh smoked salmon and scrambled eggs after enjoying some fresh fruit from the continental breakfast bar whilst I waited for my cooked food. Speaking to my chirpy waiter at breakfast, he advised me that they were full last night within the hotel, but I hadn’t noticed one other person as I walked through to my room, I absolutely loved that seclusion, having thought at the time that I was the only person here. He also advised me that the next morning would be busy with conference delegates, so to enjoy a lie in and come down later to avoid the rush, brilliant advice it was too. He also offered me freshly made toast of various types, however the team on the second morning didn’t offer us this at all, so inconsistency was noticeable, but different staff each morning I noticed. On the second morning we also went for the cooked breakfast, after my partner had asked for the waffles and was told he couldn’t have them. We looked baffled and asked why he couldn’t have them, to which our waiter advised the waffle iron had blown up six months back and still hadn’t been replaced – It was still on the menu and we weren’t impressed with the bizarre response to this order. I opted for the boiled eggs and soldiers, of which I asked for soft boiled. These were served hard boiled, without a spoon, of which I had to wander around the restaurant for quite some time to ask for and by the time I got into them, they were rock hard and I had to spoon out the dry yolks and dollop onto my cold toasted soldiers. The soldiers were wrapped in Malmaison packaging and it seemed more of a gimmicky breakfast than one of thought to the actual food within it. This was most disappointing and really let them down, as the rest of it was so good, including their varied selection of buffet breakfast options. Leeds is a shopaholics paradise, said to be called “The Knightsbridge of the North”, with Victorian arcades, historic buildings and Edwardian markets playing host to over 1,000 designer boutiques, shops and cafes. 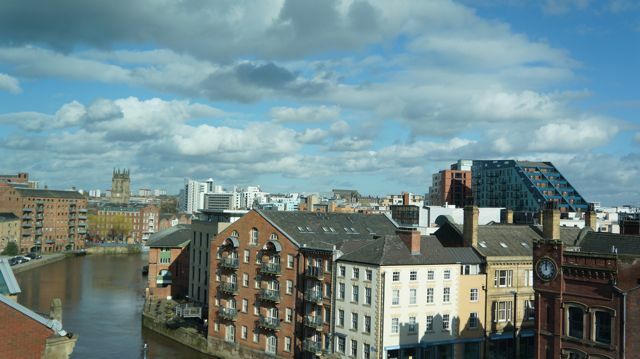 You could visit the Royal Armouries, Leeds City Art Gallery or The Henry Moore Institute. I enjoyed wandering around the Corn Exchange, where there are lots of indie clothes, jewellery and book shops amongst other treasures – Cambridge just doesn’t have anything like this, it was a new and therapeutic shopping experience. The Trinity Centre is a new shopping centre with the Trinity Kitchen a perfect food lovers haven, it houses ever changing pop-up street food vans and stands and is somewhere I adored for an exciting vibe over a beer and some traditional Indian street food on this occasion, not something I would normally opt for. 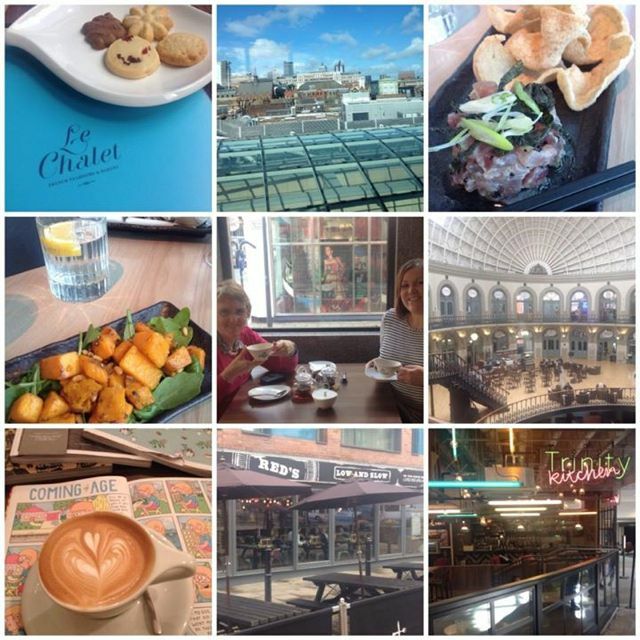 For a great Flat White, I enjoyed a visit to “Laynes Espresso” by the train station, a loose leaf peppermint tea at Le Chalet and a rooftop lunch at “Angelica” above the Trinity centre, with a rooftop view of Leeds to enjoy. I was lucky enough it have a personal tour guide in my friend, Lynn Hill of The Clandestine Cake Club, so I got to experience some truly amazing food and drink venues and meet lots of interesting people throughout my visit, so I can’t thank her enough for the catch up. 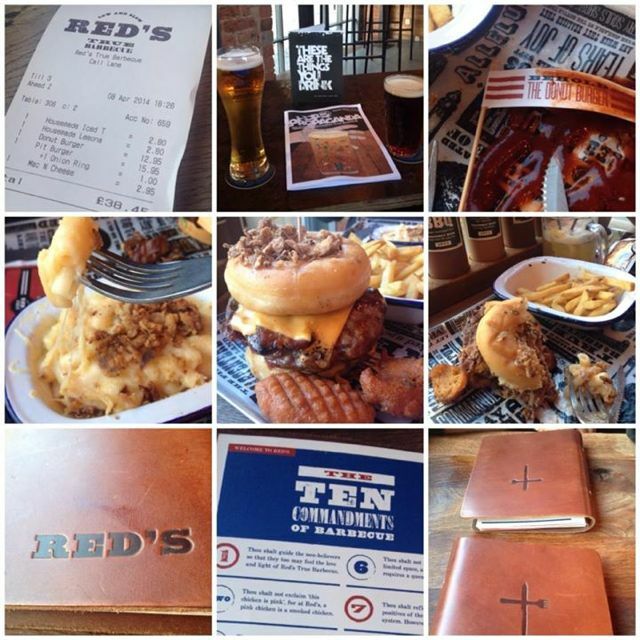 We also enjoyed a night out with dinner at Red’s True Barbecue and got to sample their renowned “Donut Burger” followed by a beer at the BrewDog bar just round the corner – there are so many fantastic places to eat out, I will be coming back to try more! Should you find yourself with a hair emergency, I can also highly rate Karla at Russell Eaton Hair, just a hop up the road from the Malmaison. She was brilliant and fitted me in at 5pm on my first night there, she was a gem and I LOVE my new hair cut – I couldn’t see my 30th birthday in with a shaggy mess, so I can’t thank her enough for sorting me out at no notice. The Malmaison website has a little route finder function within the website itself, which is fantastic and really helpful when it comes to planning your journey. There’s no on-site parking, but the nearest car park is directly next to the hotel (Q Parking) and is charged at £3.00 between 5pm and 9am and £12.40 for 24 hours using the 10% discount voucher available from the hotel reception on checking out. If coming by train, this hotel is simply a 5 minute walk from the station and very easy to find on foot. Everywhere within town is walkable, I didn’t need to use a taxi once, everything was very close by. 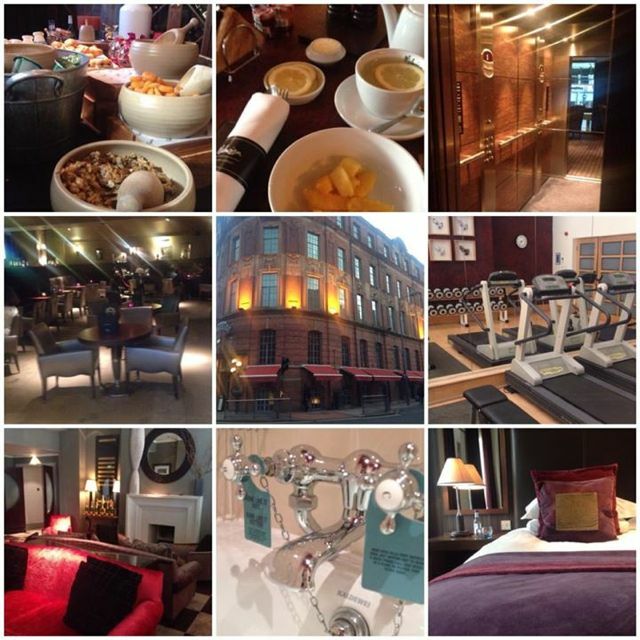 There is a “Gymtonic” gym within this hotel, although there was no mention of this on the website. It’s air conditioned and superbly stocked with fresh towels and cold water and is host to various machines including treadmills, exercise bikes and a step machine as well as a rack of free weights and mats to stretch out on. Had I known this, I would have brought my trainers with me, so I was gutted I didn’t get to make use of this. What I did love was that there is a little “running card” in the room with a suggested route to see the City by foot as you exercise, a great idea, not one I tried this time around, but I’m sure it’s a fantastic way to do something a little different on the exercise front. A complimentary newspaper was delivered underneath our bedroom door each morning, regardless of the fact I hadn’t asked for one. This was a nice touch and helped me to keep on track with recent news whilst avoiding the TV for a spell, I was impressed. Alongside the usual toiletries (of which are larger than average in this instance) there was also a fig & olive massage oil, which I really did think was a nice extra to be provided with, either to rub into your body after a hot bath or shower or to use with a partner, with the packaging reading “Gettin’ jiggy wit’ da figgy”, it made us chuckle, but most importantly it smelled delicious and was the perfect solution for a foot rub after walking around the City all day. Hotel plugs in the walls by the bed for the lamps meant that you couldn’t plug your phone in by the bed. This was a mild annoyance and we had to charge phones over on the desk overnight, hopping out to switch off the alarm – a suitable plug by the bed would be handy. There was no safe in our bedroom for valuables and no welcome pack or room information, just a “Leeds Guide Book” which was handy with a map etc, but no wifi information meant it was a little frustrating to know how to get on it, etc. There was a pencil and pad in our room, but no pen. I needed a pen to write a note, so I asked for one at reception, to which I was provided with a half chewed Barclays Bank pen on request – nice. They need to stop worrying so much about this branding and concentrate on the actual items they are providing, otherwise, it seems a little overkill to the guest. This is the perfect City hotel for a break away, I even felt safe here as a woman traveling alone, feeling completely safe walking around of an evening and everybody was friendly, everywhere I went, both within the hotel and outside of it. The hotel staff were friendly, even the housekeeping team smiled and greeted us every time we passed them, nobody ignored us, the staff were a credit to the hotel. For our room, the rate was £90 per night, bed and breakfast and was worth every penny. The room was clean, comfortable and a pleasure to spend time in, I would come back in a heartbeat. Please note – This stay was a mix of one night paid for by myself and one night complimentary, following a visit to view this venue and meet the team. I am in no means obliged to blog or write about their offerings, but I simply choose to share their offerings with my readers, should I enjoy the experience. The service team that work on the day or duration of my visit are not aware of my reasons for visiting, to enable a fair review.